BUFFALO--A member of the West Virigina Army National Guard's 2nd Battalion 19th Special Forces Group ( Airborne) exits a CH-47 Chinook helicopter assigned to the New York Army National Guard's Bravo Company, 3rd Battalion 126th Aviation, over Lake Erie in Buffalo, N.Y. on Sept. 5, 2018. The New York aircrew was assisting members of the West Virginia Army National Guard's 2nd Battalion 19th Special Forces Group ( Airborne) in conducting helocast training. 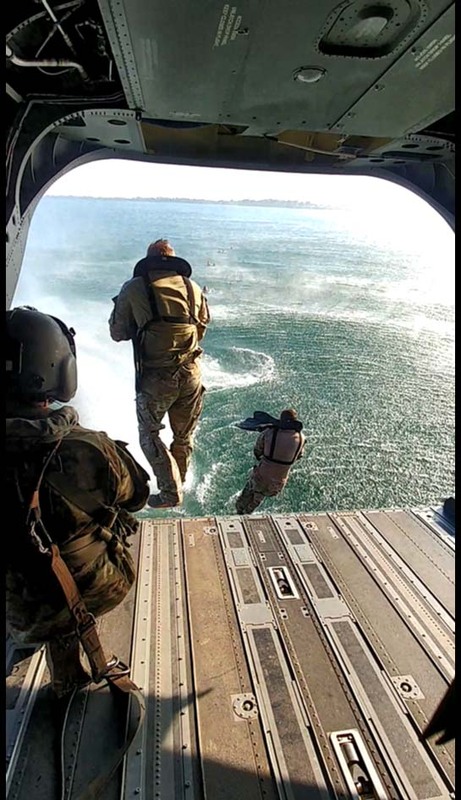 Helocasting is a technique that involves personnel exiting a helicopter into water. It is used to insert small groups behind enemy lines.